Thursday morning of this past week was a regular workday for myself and my wife. We headed out from our home to board the VIVA Blue bus southbound. The real time information board (also called "VMS") showed the bus would arrive right on it's scheduled time (6:42 A.M.). We waited and waited, the real time information boad ticked down by the minute and then said "due". I peered northwards on Yonge Street towards downtown Aurora with nary a bus in sight (not even a GO Bus!). We waited and waited until the "due" dissappeared and the following bus' time appeared "7 minutes". I peered northward on Yonge Street again seeing nothing except for the odd car. I boarded the next VIVA Blue Southbound (To Finch Station) bus # 8201 at 6:53 A.M. and inquired with the female driver where the previous bus one was. The female bus driver's reply was that the bus ahead of her broke down at the Newmarket GO Station. I sat down with my wife on a pretty full bus already that hadn't even left Aurora. Around King Road, 7:01 A.M. I called YRT Customer Service to put through a complaint about there not being a VIVA Blue bus for over 20 minutes (which is fine under the agreement York Region has with Violia) and to affect Violia's Customer Service Complaint Number Statistics (see the Region of York's Transportation Committee October 2009 Minutes Item 6 ... "Transit Operations and Maintenance Contractor Report Card... with the associated Regional Staff report). I hung up the phone at 7:10 A.M. after listening to the staticky music and the recorded voice promising me that "My call was very important to us..."
I retried dialing at 7:15 A.M. and 7:30 A.M. and holding for 2 minutes at a time with no luck either. Obviously if my call was important to VIVA or YRT they would have hired more people to actually answer the phone. What a novel idea! I called into the automated schedule information when the VIVA Blue bus I was on was at Major Mackenzie Drive and Yonge. This was because I knew I would miss both Route 85 westbound connections at 7:15 A.M. and 7:19 A.M. from the corner of 16th Avenue and Yonge Street and have to wait approximately another 20 minutes before the next Route 85 Westbound showed up. I attempted to use the automated schedule information for YRT Route 86 southbound to Rutherford GO Station as an alternative. However, the Automated Schedule information lists off every single stop from Jefferson Forrest south on the route over at least two keypad's worth of cycling through the information. I never did find the stop number as by the time I even got remotely close to getting the stop and next scheduled bus, the VIVA Blue Bus has passed Weldrick Road and was closing in on my original transfer point of 16th Avenue and Yonge Street. A lot of good that does and I couldn't get any useful assistance without waiting 30 minutes from YRT/VIVA Customer Service agents as I could imagine at the time they were probably sipping coffee and watching the phone ring. The VIVA Blue Bus finally arrived at the 16th Avenue & Carrville Road VIVA Station Three passengers, including myself, transferred from the VIVA Blue bus southbound to the Route 85 westbound. We waited from 7:20 until 7:39 in order to get going Westbound. This seems to be a little much for a busy bus route to have to wait more than 10 minutes for a bus. While waiting for the Route 85 to show up. I couldn't help but noticing that between 7:20 to 7:25 A.M. that there were 4 VIVA Blue southbound buses all bunched up heading southbound at the same time. Yet, YRT/VIVA couldn't provide bus service for 20 minutes at Golf Links & Yonge Street. You can bet the majority of these buses weren't even half full. What I find especially frustrating is that the Region of York, via David Alexander (Head of the YRT Transit Inspection), has given permission in the past for Violia (the private contractor that operates VIVA service in York Region) to rearrange the buses that normally begin their service at Bernard Avenue to serve those coming or going from Newmarket/Aurora/Oak Ridges if maintenance issues presents themselves. This is because at least the full VIVA Blue route from Newmarket GO Terminal to Finch Subway Station would be served with regularly spaced service instead of only a shorter section (i.e. brom Bernard Avenue to Finch Subway) I believe, as today proves, Violia failed in that regard. This is proven because the yard for the VIVA Buses on Yonge Street is based at Yonge Street & Green Lane in Newmarket. Thus, the buses that begin at Bernard Avenue do use Yonge Street, for the most part, to head down to Bernard Avenue & Yonge street to start their route and could have easily been pulled into service by YRT/VIVA or Violia Managment earlier in Newmarket to replace the service as best as possible for those travelling southbound from Newmarket, Aurora and Oak Ridges. But things only got worse from there. After boarding Route 85 at Yonge Street & 16th Avenue in Richmond Hill, I dialled into YRT Customer Service (AGAIN!) At 7:45 A.M., this time someone finally picked up. I started at the beginning that I was trying to board the bus at "GOLF LINKS DRIVE". However, I had to repeat the words "GOLF LINKS DRIVE", first slowly, then yelling so everyone on the bus I was on could hear it. Then we moved through my story. Quite frankly, I could barely understand the YRT Customer Service agent due to the accent and the loud background noise at YRT Customer Service Call Centre. By the time I hung up the YRT Route 85 driver was laughing at my plight. But I forgot to get my YRT Customer Service Tracking Ticket number so I redialled. Luckily, I got the same YRT Customer Service agent back on the phone. I told the Customer Service Agent I literally had just hung up the phone after requesting a complaint be put through. I gave her my phone number which she had recorded the complaint under. However, she claimed she had no idea who I was. It sounded like she was playing dumb and didn't wish to put through a YRT Customer Ticket. (Heck it sounded like picking up the phone was too much for her to handle!). I asked to speak with a YRT Customer Service Manager three times over. The YRT Customer Service Agent refused and kept asking me for my complaint. I told her that I had already put through my complaint and just wanted to get my confirmation number tracking number and that she refused to do so. In broken English she told me I could hold. She then picked up my call again without saying a word. I could tell she picked up the call because I could hear the YRT Customer Service Centre's background noise. She then hung up on me. I redialed again and received another YRT Customer Service agent who I could barely understand as well. From my point of view it appears YRT has farmed out their front line Customer Service phone agents to someplace in India. I asked if I could speak to a YRT Customer Service Manager or Supervisor and she said I could. Then she asked for my name and my complaint so she could take it down. Feeling like I was getting no where with the poor Customer Service at YRT I was experiencing I asked to speak to a YRT Customer Service Manager within 2 minutes or I would be contacting my Regional Councillor in either Vaughan or Aurora. Sure enough, in 2 minutes I had Rosanna Agostino (YRT's Supervisor of Customer Service Supervisor) on the phone. I relayed my message again to Rosanna about the trials and tribulations of getting to work this morning. Rosanna seemed sympathetic to the my experiences. This sympathy I did appreciate as normally from YRT Customer Service Agents I've expereienced and heard from other YRT Passengers that nothing really happens except aggravation. At the end of the call I asked Rosanna for a YRT Customer Service Ticket number. She apologized that her computer wasn't up and running at that moment but would call me back in 5 minutes. That call ended at 8:20 A.M.
After hearing nothing back from Rosanna, I called back to YRT Customer Service to follow up with I spoke with Elsie and explained that Rosanna failed to call me back within 5 minutes with a valid YRT Cares Ticket number. Elsie replied that she put in the YRT Cares ticket herself and gave me the ticket number (T58486). So finally after 2 hours YRT Customer Service received my complaint, recorded it and responded with a tracking number. No less than four people working at YRT Customer Service had to work on this complaint. It is no wonder I've heard from fellow transit riders that caling YRT Customer Service only gives them the "runaround". If the above isn't "the runaround" I don't know what is. Further, apparently there is no "Service" in "YRT Customer Service" today as it seems I, the YRT Customer, had to go above and beyond in order to ensure my complaint was put in and hopefully followed up on by David Alexander and his team of YRT Transit Inspectors. But the morning was not the only thing that made commuting with YRT/VIVA. On my way home at the 16th Avenue/Carrville Road Northbound VIVA Station I witnessed and anonamosly reported to YRT Customer Service a situtation. 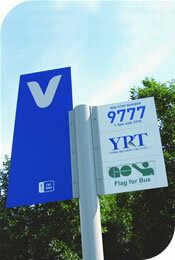 A YRT Route 99 (Bus Number 712) pulled in first followed by a VIVA Blue to Newmarket Terminal Bound bus (Bus # 8203). A man in a wheelchair who had just deboarded a Route 85 Westbound bus using the bus's ramp came arround the corner. He easily made it to the Route 99 bus as the last "able bodied" person boarded the bus. The Route 99 Bus driver closed his doors and moved forward a bit closer to the Bus Stop sign so the VIVA Blue bus could fit in at the stop as well, held for five seconds, looked at the man in the wheelchair and pulled off without opening his doors. No explanation seemed to be provided by Route 99 driver for not picking this gentleman up, just a quick close of the doors and off the bus left. I boarded the front of the VIVA Blue bus and spoke with the driver pointing out the situation to her of what just happenned. By the time I explained what happenned the man in the wheelchair was at her front door. The VIVA Blue driver got up and requested the man meet her at the middle door of the bus so she could load. The VIVA Blue bus driver was very courteous in loading the man in the wheelchair and strapping him down properly as best she could as per the law (this requirement is referenced in YRT's November 2009 My Transit Customer Newsletter). FINALLY SOME CUSTOMER SERVICE! HOORAY FOR THIS VIVA DRIVER! I found the attitude of the YRT Route 99 bus driver to be intolerable this day in age. This is because: A. His bus was a low floor bus with a ramp (the very same moddle of bus that the man in the wheelchair deboarded from on Route 85 at 16th Avenue and Yonge). B. The VIVA Blue 16th/Carrville VIVA Station is fully accessible for VIVA buses (I've seen many VIVA Buses board people in mobility devices boarded at this stop) so why not YRT Vehicles? C. The YRT Bus Driver failed to board the man in the wheelchair despite there being a clear sticker on the Bus stop sign stating it was an accessible stop as per the YRT My Transit Newsletter from November 2009. D. He had room on his bus, it was barely half full! Bottom line, YRT failed on this one. But again, I do give kudos to the VIVA Bus driver on Bus # 8203 for boarding the man in the wheelchair. I followed up the above with an e-mail to Rosanna Agostino (YRT Customer Service Supervisor), Ettore Iannacito (YRT Customer Service and Planning Manager), David Alexander (YRT Transit Inspection Supervisor) and Phyllis Morris (Mayor of Aurora and York Regional Councillor for Aurora) with my concerns of poor service provided by YRT on that Thursday. In response, I received a phone call from Ettore and an e-mail from Rosanna. Ettore promised my issues would be followed up by YRT Operations Staff. Rosanna on the other hand responded on Friday at 4:05 P.M. that she was thankful for notifying YRT Customer Service about my concerns. "...with respect to the incorrect VMS display has been entered in our tracking system to be addressed by our Transit Management Systems section. Your ticket reference number is T-58486." "Your concern pertaining to the missed Viva Blue trip scheduled for 6:42am has been forwarded to our Operations section. Your ticket reference number is T-58502." The she goes onto blame the YRT Customer Service Centre issues on, what she claimes the newly " implemented a new telephone system the evening prior" which caused YRT Customer Service to experience "some technical difficulties when the call centre opened that morning." But nonetheless, Rosanna goes onto say that YRT is "pleased to announce these problems have been corrected and everything is now working as it should. We appreciate your patience while we worked through the issues." Apparently nobody at YRT Customer Service thought of testing the new phone system after installation the previous evening occurred. Testing should have been done throughout Wednesday evening through to activation for the next work day on Thursday. But, again, apparently this would have been too easy to do thus it was never thought of at YRT Customer Service. Then perhaps your Customer Service Agents who picked up the phone would have heard me let alone speak English. As for not picking up the phone for 10 minutes from 7:01 to 7:10 Thursday morning, Rosanna didn't provide an explanation. "Your feedback is important to us; you can be assured the investigation process was initiated immediately following our conversation." "OUR MISSION: To provide quality public transit services which support the economic vitality,environmental sustainability, and health of the Regional community." When reading the above lines I nearly laughed at the hypocrisy of "providing qualtiy public transit services..." being part of their mission statement. I replied this morning with another e-mail to Rosanna reinterating how disgusted I'm with YRT's service on the above issue. I also requested that : "Further on the accountablitly, I also would like a Customer Service Ticket number issued on an investigation of the Customer Service issues I experinced with the YRT/VIVA Customer Service Department that day. Hopefully an investigation and response will uncover possible corrections on what went so wrong with the YRT/VIVA Customer Service centre that day as well. Please forward the ticket number or a response by Monday April 19, 2010 by 5:00 P.M. or I will be following up with Aurora Mayor Phyllis Morris for a response on this issue." AND "I eagerly await YRT Operations to reply to these severe issues. I also wish to give permission to release the response(s) to Aurora Mayor and Aurora Regional Councillor Phyllis Morris to receive a copy of this reply as well if my permission is needed. I believe both YRT/VIVA, Regional Managment, Councillors and myself deserve full accountability on the issues listed above. "To provide quality public transit services..."
Right now as a taxpayer and voter in York Region I'm disgusted. The service provided by YRT/VIVA on Thursday was outrageous. I would figure after five years of amalgamated transit and VIVA service that: A. Maintenance issues on VIVA Blue wouldn't present such a logistical problem in keeping at least a minimal level of service along the entire Yonge Street corridor; AND B. That people in Mobility Devices would be so poorly treated. AND C. Such poor customer service by the YRT Call Centre. As a voter, especially as the future municipal election nears, I will be watching for improvements at YRT/VIVA. Stay tuned!